The Waste Electrical and Electronic Equipment (WEEE) Directive imposes several obligations upon producers of electrical and electronic equipment. Worldline IT Services UK Limited, as a producer of WEEE, notably in the area of ticketing equipment, maintains legal compliance, and the following text outlines our approach to fulfilling these obligations. Worldline IT Services UK Limited is registered with the UK Environment Agency, with Producer Registration Number: WEE/EH4475RU. Prior to the end of 2013, our EEE was produced by Atos IT Services UK Limited which was formerly registered with the UK Environment Agency, with Producer Registration Number: WEE/HG3021VY. This registration is now dissolved. The former Siemens Information Systems business, acquired by Atos during 2011, was formerly registered as Producer Registration Number: WEE/KB0054TQ. This registration is now dissolved. From hereon, reference to our obligations under each registration is referred to under the name Worldline IT Services UK Limited. All Worldline IT Services UK Limited products that are subject to the WEEE Directive from August 13th 2005 are compliant with the WEEE requirements. 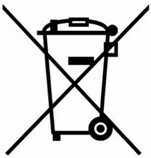 Such products are marked with the “crossed out wheelie bin” WEEE symbol along with one of the two Unique Producer Identification Marks (UPIMs) as shown below in accordance with European Standard EN 50419. This presence of the above symbols on the product or on its packaging indicates that this product must not be disposed of with normal office or household waste. Unless specifically agreed within contractual terms, you should contact Worldline IT Services UK Limited via your Account Director through your normal route, and arrange for the collection of this WEEE for appropriate environmentally sound disposal. Worldline IT Services UK Limited confirms that treatment and recycling of WEEE done on behalf of Worldline IT Services UK Limited, either by a collective scheme or individually, is carried out in accordance with the requirements of the WEEE Directive, as set out in the implementing legislation of the member states, including requirements respecting special treatment for specified parts and overall recovery rates achieved.